One day, while lost in a daze of website strolling, we stumbled upon BloesemKids, one half of an incredibly gorgeous website put together by founder and editor Irene Hoofs. Originally from Amsterdam, Hoofs vision is to put together a blog that "is a truly delightful reference of abundant treats for kids". With stories and ideas written by both guest writers and Irene herself, the website is filled with creative gems that are as simple to take on as they are stunning to flip through and admire. We spotted "The Long Reach Gizmo" and were instantly inspired to come up with our own design. Hence, the birth of the Love Bird Connection! 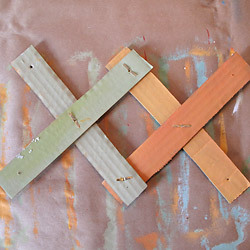 • Recycled Cardboard Box cut into two 2" x 8" strips, and four cut into 1" x 8" strips. 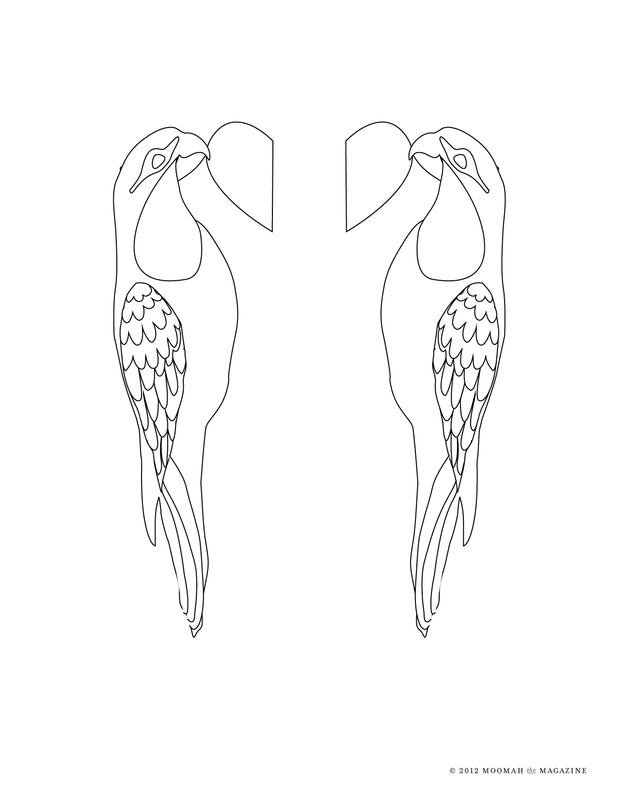 PRINT the Love Bird stencil and cut around the outline until you have both birds and their halves of the heart. 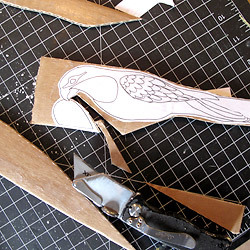 GLUE the birds onto the 2" x 8" pieces of cardboard. Make sure to coat the entire piece of cardboard before laying down your printout. 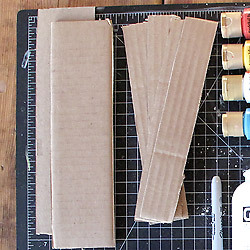 When you've place your printout onto the cardboard, apply another coat covering the printout. 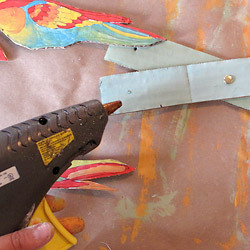 We used Golden Matte Medium as our adhesive for a smooth finish, but you could just as easily use mod podge. Allow to dry. 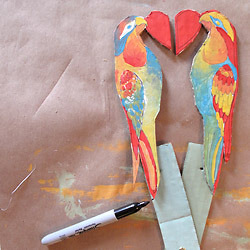 CUT around the outline of the birds using an x-acto knife, so that you eventually have both birds backed onto cardboard. 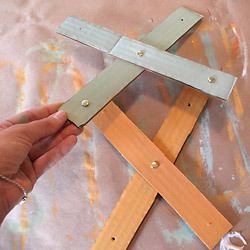 MEASURE four 8" x 1" strips of cardboard and cut them out for the "handles". 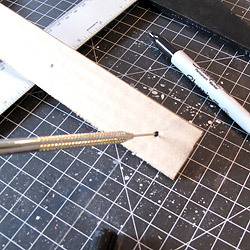 POKE two holes into each 8" x 1" strip of cardboard, where your brad will fit. On each strip, make one mark at the top (at the 1" mark) and one in the middle (at the 4" mark). Make sure to measure your hole placement to ensure that all strips are identical. PAINT all cardboard pieces choosing which ever colors you desire. 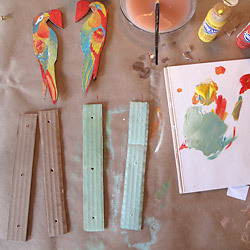 We liked the idea of a traditional multi-colored parrot and different colored handles. Allow to dry. ATTACH the brads in their correct holes, criss-crossing the strips to make the handles. Start with two strips. Lining up the two middle holes, use the brad to connect together. Repeat with the other two strips. Turn over and open the wings of the brad to secure. 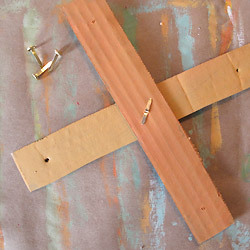 JOIN your two criss-crosses by slipping brads into the top holes of your strips. Turn over and secure. 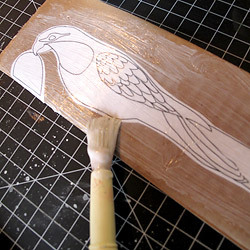 GLUE your birds onto the ends of the handles. We used a hot-glue gun to be sure it was strong and stuck well. 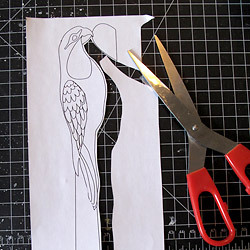 To be certain that the heart lines up when closed, lay your birds down in the desired position and use a sharpie to mark the correct placement before gluing. Let us teach you to sew until your heart's content.